DOWNLOAD OUR FREE E-BOOK! We will lead you step by step through "Nanny Tax" essentials. Simply fill out the request form at the right and we will send you this e-Book immediately! So you hired a nanny, housekeeper, maid, senior caregiver or household employee. Now what? > Quick Steps: The Nanny Tax compliance process. > Employee or Independent Contractor? > Best Practices at Time of Hire. > Possible tax savings for you. Learn from the "Nanny Tax" experts. 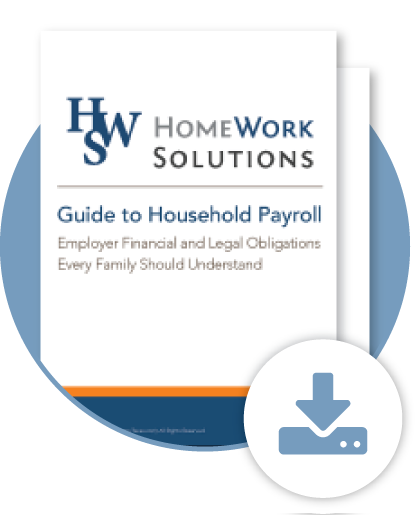 Thousands of families nationwide have trusted HomeWork Solutions with their nanny payroll and "Nanny Tax" compliance. Go ahead - Simplify! Copyright © 2018 HomeWork Solutions. All rights reserved.